I went for a walk the other day to my favourite spot, which is the wetlands, three kilometres from my home. This place is so peaceful and not many people go there during the day, and at midnight nobody. I live in suburbia, so it is great to have a place like this so close. It is the home of lots of different types of water birds, frogs, snakes, crows, lizards and many other animals. The wetlands used to be a sacred place for indigenous people. Till the time of the early settlers from Europe came and used the land for grazing cattle and as a sheep station. The early settlers found that it was an ideal place for their live stock, due to its water and rich plant life along the wetlands to feed them. So as you can imagine, this is a very special place to me, mainly because of its indigenous cultures, rather than the European settlement. To me, the indigenous people of the land are the real hero’s, which sadly not much history can be found on them in this area, other than it was once their tribal land. As well as wetlands, ponds, lakes, there is lots of very old tall Gun tree’s, river Gum. To me, on finding a place like this, it is always good to learn what I can about the history, this helps me to connect with the land a little bit better. I often go to the wetlands, to meditate, contemplate, talk with the spirits of the land, ancestral spirits and other spiritual creatures. I also recharge my energy by absorbing the energies of the trees into my body and Sphere Of Sensation. In return I give an offering of milk and bread as a thank you. As I have come to learn over the years, that if you take something from the environment, you should give something back in return. Anyway, before I set off on my walk on this accusation. I asked the spirits that are around me, if they could find me something of the land, that I could use that was very powerful. I had only walked about one kilometre and saw a black coloured stone on the ground, it seemed to glitter in the sun. I knew right away that this was the spirits gift to me. I picked it up and took a closer look at it. 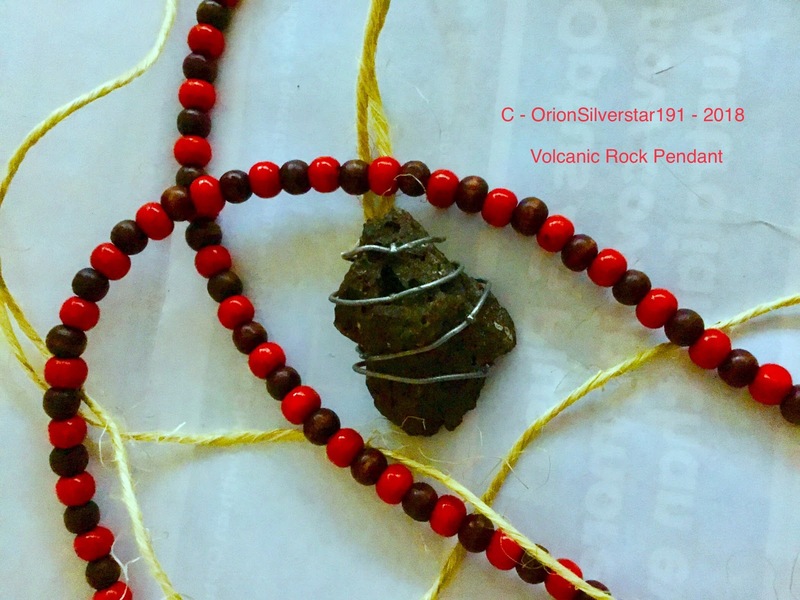 I noticed that it had very small crystals within it, that sparkled as I moved it in my hands. With that, right away the spirits told me that what I was in fact holding, was a peice of Volcanic rock from maybe thousands of years ago, from this place. I was over the moon so to speak and very thankful. I decided to make it into a pendant. I put wire around the rock and attached string to it. I am however, thinking of changing it to copper wire around it. As copper is a good conductor of energies. Sometimes wands made in the Hermetic Order Of The Golden Dawn tradition have wire through them for this some reason. I am also thinking of replacing the string for leather strap. However this will do for now. 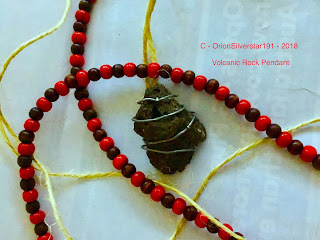 Here is a picture of my Volcanic rock pendant. Thanks for showing an interest in this blog, please feel free to share the blog or and leave me a comment thanks.